Interserver Website Hosting Review 2019 - Good or Bad? 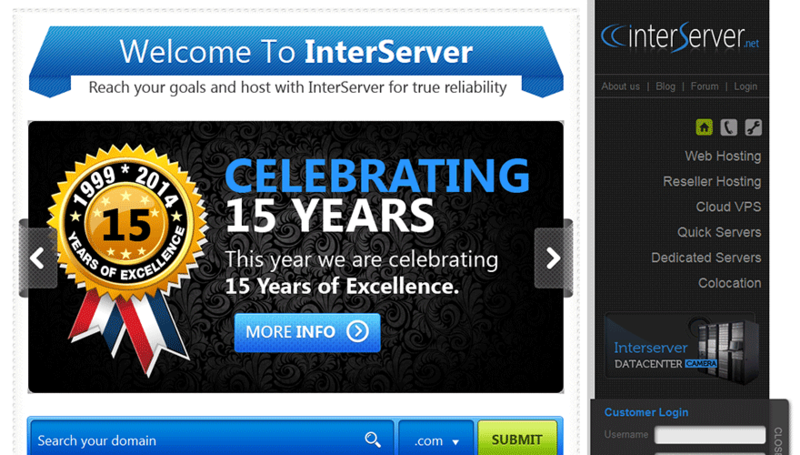 Interserver is a company that has been around for well over 15 years now (started in 1999). In 2006, they built their own datacenter in Secaucus, New Jersey and has grown ever since. They boast having customers from individual freelancers all the way to Foprtune 500 companies. They company proudly announces that their core management and founders have remained with the company since day one. They consider all employees equal with the president answering tech calls, answering tickets and more. We love the up-front pricing so visitors know exactly what they will pay without having to go through the checkout process. A full upgrade path is available from shared web hosting all the way to dedicated servers. The customer support section of their site leaves a lot to be desired. They mention a cloud solution, however, we couldn’t find any details on how this is setup. We could only find details about their datacenters in NJ, USA. The above was found as their pricing and verified with a fake checkout process during our review. They offer 5 ways for you to pay for the same plan which changes the pricing from $4.70 to $3.96 depending on how long you are willing to prepay for your hosting service. The top of their web hosting page touts “Cloud Web Hosting,” however, we were unable to determine exactly what that means for their plans. We know they only have datacenters in New Jersey, so where does the cloud service come in to play here? If they simply offer the services of CloudFlare, which is a free service to anyone that has web hosting with any hosting company, it really shouldn’t be called “Cloud Web Hosting.” I browsed their website for a considerable time and couldn’t find any reference to their cloud setup. Other than that, they do offer a $1.99 domain registration. Many of their competitors offer a free domain name when you register for web services, however, we do find that this pricing isn’t too bad since most domain registrars charge over $9. Their web hosting also offers cPanel, a script installation service (over 275 scripts including WordPress), a 30 day money back guarantee and free site migration. The plan features “unlimited everything” including domains, disk space, transfer databases and more. Their customer service offerings on the site leave a little to be desired but it isn’t terrible either. During our review, we found the helpdesk updates section was last updated 4 months prior to the time of this review. The ticket submission system is fairly straight forward and easy to use. They have a “Troubleshooter” section on the site that is bone dry. Nothing in it as you can see by our screenshot. Additionally, if we clicked “Downloads” we’re delivered an empty screen with nothing displayed (including HTML source code). It’s obvious they don’t have a dedicated employee managing their website. If they do, they aren’t doing their job and the company as a whole is leaving money on the table. If customers and reviewers see this on their site, they leave or write a review like this one (sorry guys, doing my job). Lastly, at the time of this review, the Live Support system was “AWAY” and not available to receive requests. On the positive side of things, their Knowledgebase is fairly decent with lots of content added to help the user find answers to common solutions. Their community forums feature has updated content with users appearing to participate on these forums regularly.